Despite the celebrations of rising high school graduation rates across the country, it’s no secret that far too often, graduating from high school doesn’t mean what it should. College faculty and employers of high school graduates report high levels of dissatisfaction with the preparedness of recent grads. New college students often have to pay for remedial classes that cover content they should have learned in high school and do not provide college credit. Roughly 50 percent of graduates themselves report that they lacked the knowledge and skills they needed for success after graduation. Far too many students and their families are caught by surprise; if you graduate from high school, doesn’t that mean you should be ready for what comes next? States across the country are working to provide students with more options — and that’s good news. Students should have choices in school to tailor their education to their interests and goals. Providing options in which courses to take and how graduation requirements are structured can increase both the number and the diversity of students who finish high school college- and career-ready. These state graduation pathways have significant implications. Gaps in college and career readiness are often highest among students of color, low-income students, and English learners, perpetuating societal inequities as graduates move through life. But in an increasingly complicated space, it is harder for students and families to understand where all pathways lead. Achieve’s new graduation requirements website — which includes a data explorer with details of every state’s graduation options, as well as a new policy brief exploring the equity implications of how those options are structured — seeks to add transparency and encourage states to make sure their K-12 systems connect with the needs of higher education and the workforce. As states consider new and innovative ways for students to earn a high school diploma, there are critical questions they need to keep in mind. Are all students expected to take the rigorous classes necessary for college and career readiness? Is there just one route to graduation, or are there several paths? If students have choices, on which path do they automatically start when they begin high school? This last question is becoming especially critical in many states. For the graduating class of 2017, 29 states offered more than one graduation option, including at least one focused on college and career readiness that would require rigorous classes. However, those 29 states could be divided into two groups based on one very important difference: where students automatically start. Fourteen states automatically started all students in the rigorous-course option, with the choice to switch to a less academically demanding option, if needed; the remaining 15 states automatically placed students on a less rigorous pathway and put the burden on them and their families to opt into the college- and career-ready option. Though there are limited state-reported data on how many students complete each graduation option in these states (a problem in itself), the data we do have are troubling. When students are not defaulted into a college- and career-ready graduation option, low-income students and students of color are much less likely to graduate having taken coursework that prepares them for success in college or a career. For instance, in Indiana, where all students automatically start out in the college- and career-ready graduation option, 86 percent of black students and 88 percent of Hispanic students finish the more rigorous option; in California, where the burden is on students to opt into the college- and career-ready option, just 36 percent of black students and 39 percent of Hispanic students go on to complete the more rigorous option. Giving students choices and appropriate safety nets is a good thing, but how those choices are structured matters tremendously. The landscape of state graduation requirements is evolving, and the conversations many are having about how to best serve all students represent an exciting opportunity to improve outcomes and close gaps. 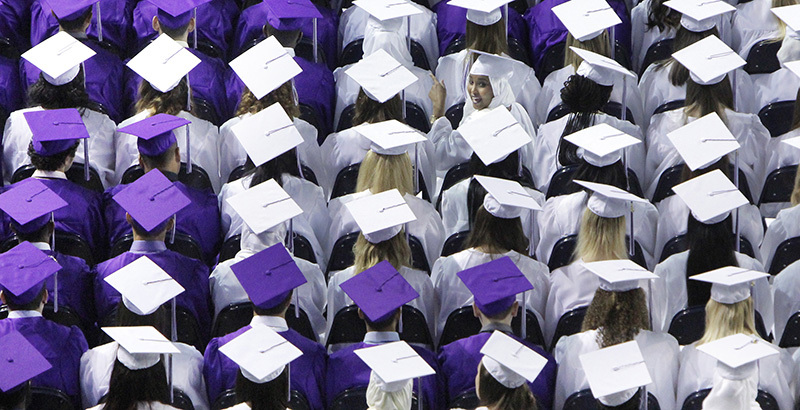 Graduation options and requirements are a powerful tool at states’ disposal; making careful choices about graduation structures can result in better outcomes for more students and higher levels of readiness for all. Michael Cohen is president of Achieve, a nonprofit organization created by a bipartisan group of governors and business leaders that for two decades has led the effort to help states make college and career readiness a priority for all students.